Trip Log, Day 1: Shortly after we landed and dropped off our bags chez Cake Gumshoe Bridget in Cole Valley, we hightailed it to La Boulange. Apparently they are a mini-chain and have a few locations throughout the Bay Area, but Bridget assured us that this one was the best location--not only because it was the cutest but because the pastries for all the locations were baked here. We went for the most serious-looking tart in the case: The chocolate ganache. 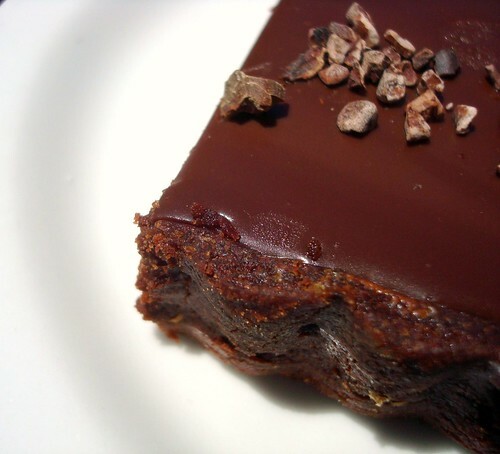 When you put this tart on the table, the aroma of chocolate is redolent in the air--and every bite is just as dreamy, silky and rich as we hoped it would be. Le sigh. 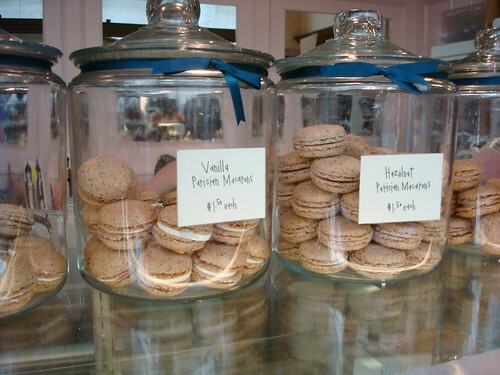 Walking down to the Ferry building, we managed to find an appetite for Miette, the cutest little patisserie around--though it's now under new ownership, no major differences seem apparent as you walk in. We picked up the "Old fashioned" cupcake (pictured top), which is pretty as a picture and like a high-quality hostess cupcake riff. 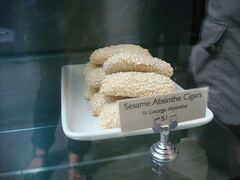 In the Ferry Building we also saw some intriguing sweets at Bluebottle Coffee (absinthe cookies!) and Frog Hollow (where we tried a sample but didn't actually buy any of their gorgeous fruit pies, tarts or homemade pop-tart-like treats)--but believing in some modicum of moderation, we said "next time". 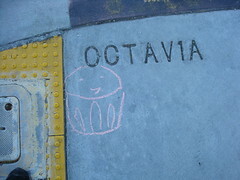 We also had some fun on our walk leaving some sidewalk-chalk Cuppies in our wake. The day got even awesomer though, when we dropped by the Foodbuzz offices for Friday Happy Hour with the awesome crew, who fixed us some very classy pinkies-out drinks consisting of champagne, fresh peach puree and basil. Yum. Trip Log, Day 2: We began with a trip to Tartine, a famous bakery about which we've never managed to hear a bad review. Happily, it lived up to all expectations, both on the sweet and savory side: the quiche was like no other I've ever tasted, almost custardy in texture. 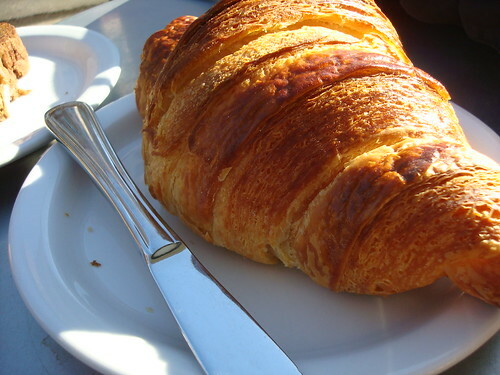 The croissant had perfect crispy edges which shattered when you bit into it, giving way to soft, buttery, flaky layers. 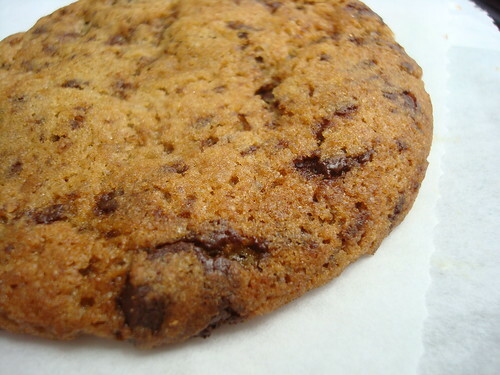 Although the chocolate chip cookie (which was probably 6 inches across, by the way) was crispier than we both generally like, we both had to admit that the flavor--buttery, rich with brown sugar--was impressive. Spending the morning vending at the Renegade Craft Fair started to give us a respectable appetite, so we were so pleased to have our booth right next to Cynically Delicious, a custom cupcake business; as mentioned in a previous post, they had some seriously sweet (and delightfully tongue-in-cheek), pop-culture reverent cupcakes. Yes. But as anyone knows, three cupcakes are never enough, so we couldn't have been more delighted to receive a surprise visit from Karen Tripp, owner of Frosting Bake Shop in Mill Valley, who came by bearing boxes of delicious cupcakes. We'd sampled their cake bites in the past so it was exciting to graduate to full-sized cupcakes. What really haunted us about these cupcakes was the delicious frosting, which was generously applied but somehow had a lightness about it--the strawberry and cookies n' cream frosting were our favorites. Trip Log, Day 3: After starting out with a very generous breakfast from Reverie, you might think our appetites for sweets might have been dampened, but you would be wrong. 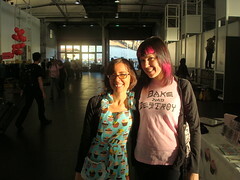 After a morning of selling some sweet CakeSpy art and getting a pick-me-up from Cynically Delicious, we explored the craft fair area for some other sweet treats (all the while also browsing some awesome artwork by Mati Rose, Lisa Congdon, Eleven Eleven Industries, Ugly Baby Shower Art and more!). 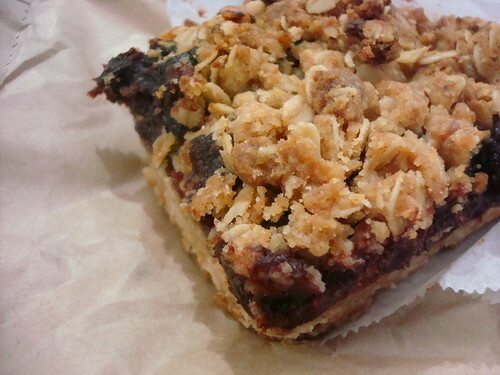 Nearby the craft show at the Fort Mason Pavilion Center is a cafe called Greens to Go, and as intensely unsexy as they might sound, their date bars are truly incredible: a firm crust topped with a thick slab of date puree (I know, just trust me on this one!) and all topped with a crumbly, oaty, slightly salted crumb. Not sure if these were made in house or from Artisan Bakers (per their website, some of the pastries do come from there). Once again, just trust me on it: they're good. The day got even better with a surprise visit from Claire Keane, proprietress of Clairesquares--who I have done artwork for many times in the past but never actually met. She's adorable and wonderful, and she came bearing Clairesquares--a decadent and completely addictive confection consisting of a shortbread crust, a thick layer of caramel, all topped with chocolate (she does both milk and dark chocolate). 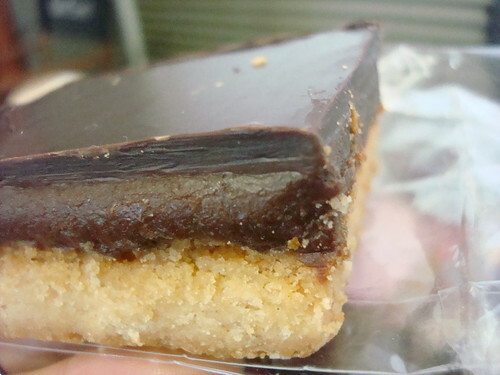 These are no common millionaire's shortbread--Clairesquares are really something else. Excitingly, they're adding to their offerings, too, with deep fried and chocolate covered squares. 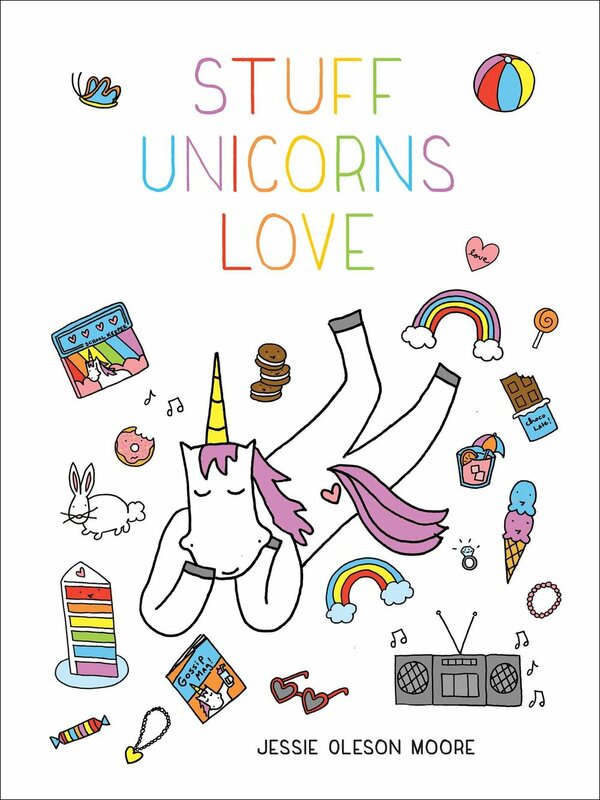 The original ones are available for purchase online. 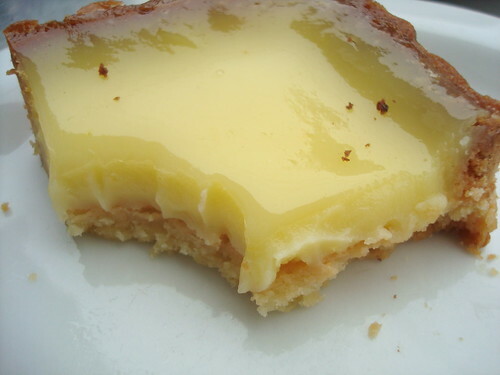 Trip Log, Day 4: Once again we started at La Boulange, picking up some croissants and a most delicious lemon tart, which was sweet and tart at the same time. Heading over to Berkeley, we took a walk through the Gourmet Ghetto, stopping to check out the Cheese Board and marvelling at the original Chez Panisse (kind of like a foodie's equivalent to seeing Mount Rushmore or something). In the mood for ice cream now, we headed back to the city and over to Bi-Rite; we had heard that either this spot or Humphry Slocombe were the places to hit (alas we did not have time for both!). Bi-Rite actually reminded us a lot of Seattle-based Molly Moon's; they had a lot of the same flavors including Salted Caramel and Strawberry Balsamic. The salted caramel at Bi-Rite was just as it should be: creamy, smooth, and salty-sweet; we also picked up a chocolate chip cookie (just 75 cents!) which was respectable too--once again, a little crispier than we generally prefer but flavorful and delicious. Curiously, they also had a confection for sale called chikki--got to try that next time! Heading over to the airport and back to Seattle, we may or may not have indulged in another Clairesquare--but arriving home, little bellies taut with delicious treats, we were happy to reflect that this trip was utterly, completely, totally sweet. Bi-Rite Creamery, 3692 18th Street, San Francisco, (415)626-5600; online at biritecreamery.com. Bluebottle Coffee, multiple locations; online at bluebottlecoffee.net. 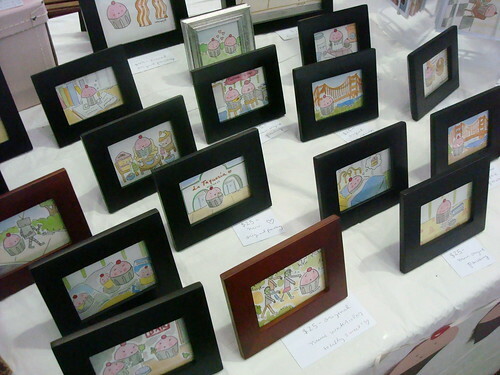 Clairesquares, available at the following Bay Area retailers or via their online shop. 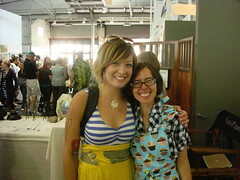 Cheeseboard Collective, 1512 Shattuck Ave., Berkeley; online at cheeseboardcollective.coop. 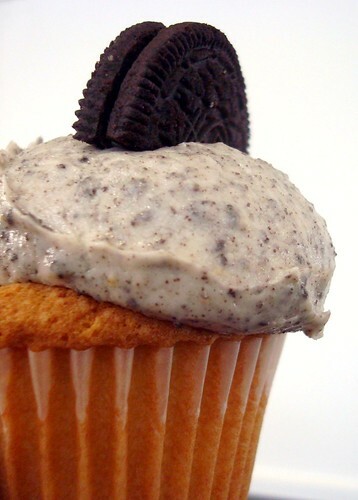 Cynically Delicious, by custom order; online at cynicallydelicious.com. Frog Hollow, Ferry Building; online at froghollow.com. 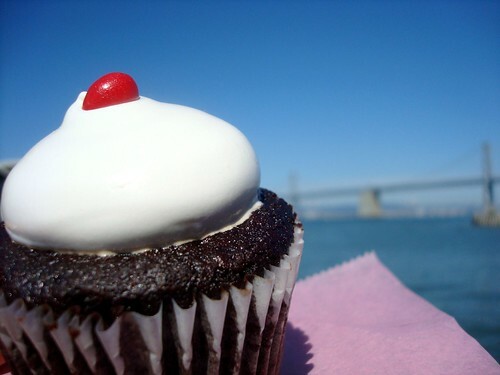 Frosting Bake Shop, 7 E. Blithedale Ave., Mill Valley (415)888-8027; online at frostingbakeshop.com. Greens to Go, Fort Mason Center; online at greensrestaurant.com. 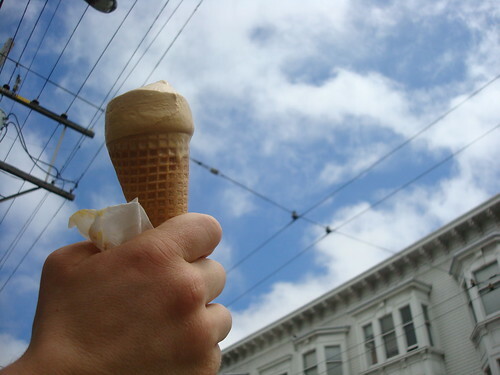 Humphry Slocombe, 2790 Harrison Street; online at humphryslocombe.com. La Boulange, multiple locations (we visited 1000 Parnassus Street in Cole Valley); online at laboulangebakery.com. Miette Patisserie, multiple locations (we visited the one in the Ferry Building); online at miettecakes.com. Tartine, 600 Guerrero Street, San Francisco (415)487-2600; online at tartinebakery.com.